Format: Streaming video from NetFlix on the new internet machine. It was not lightly that I entered in to watching Incredibles 2. I am a huge fan of the original, so my expectations going into this sequel were…unsure. On the one hand, sequels frequently don’t measure up, often leaving the fans of the first disappointed. On the other hand, this is Pixar we’re talking about, and Pixar doesn’t make a lot of mistakes, and many of their sequels are at least pretty good. But again, my expectations were hopeful, but guarded. Incredibles 2 picks up immediately at the end of the first movie. 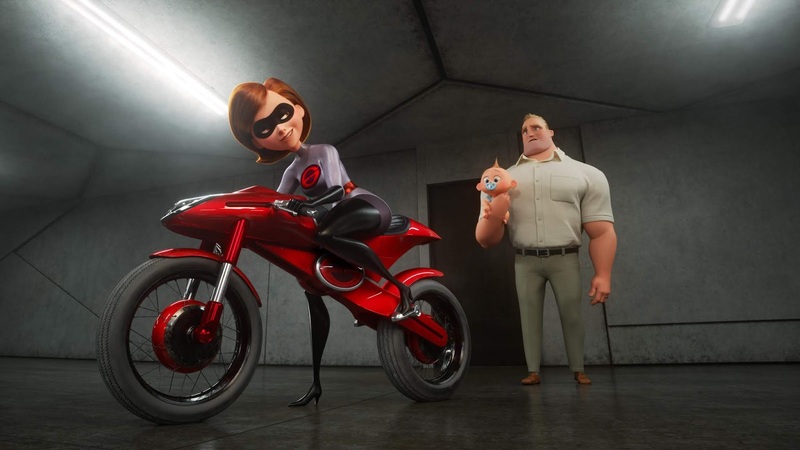 The Parrs, Mr. Incredible/Bob (Craig T. Nelson), Elastigirl/Helen (Holly Hunter), and kids Violet (Sarah Vowell), Dash (Huck Milner), and baby Jack-Jack (Eli Fucile), along with fellow superhero Frozone/Lucius Best (Samuel L. Jackson) are attacked by a new supervillain who calls himself the Underminer (John Ratzenberger). They battle, and the Underminer not only successfully robs a bank, he sets his machine against the surface world, causing a great deal of destruction. All of the good will created by the capture and death of Syndrome in the first film is wiped away by this new round of destruction that seemed completely avoidable. Once again, the Parrs are left to the tender ministrations of the government and their agent Rick Dicker (Jonathan Banks). This time, though, Rick is only able to get them out of police custody and into a motel for a couple of weeks; the agency that has been protecting them and the other supers-in-hiding has been dissolved by the government. And so, the Parrs are in at a crossroads, wondering what to do when Lucius shows up with an offer that he’s been made. An eccentric billionaire named Winston Deavor (Bob Odenkirk) whose father loved and respected the supers has decided to do everything he can to make them legal again. To that end, he enlists Mr. Incredible, Elastigirl, and Frozone to do hero work to give the supers a positive public image once again. However, since Mr. Incredible has a penchant for causing a great deal of destruction, it’s Elastigirl who gets the call. Of course things are going to get more complicated than just her saving the day. We’ll get the appearance of a new supervillain called the Screenslaver who hypnotizes victims. Assisting Elastigirl is Winston’s inventor sister Evelyn (Catherine Keener). Meanwhile, Bob/Mr. Incredible is left dealing with the kids. This means having to deal with the fact that Violet’s crush (who she made a date with at the end of the first movie) has forgotten her completely thanks to having his brain wiped by Rick Dicker. It means dealing with the new math, since Dash is struggling in school. And it means dealing with Jack-Jack’s emerging superpowers, which are legion. The biggest issue with Incredibles 2 is that it isn’t The Incredibles, which remains my favorite animated movie. It does a lot, but it falls into some of the tropes that I hoped it would avoid. Bob Parr, as the father, is initially hopeless as the stay-at-home parent. He’s eventually sleep deprived and makes all the wrong decisions over and over. Yes, he eventually figures it out a bit, but it doesn’t change the fact that the movie went this route. It’s not that this trope is offensive (although as a former stay-at-home dad, the idea that fathers are somehow incompetent at parenting pisses me off). It’s that taking this part of the story in this direction is lazy. This is the movie equivalent of a stand-up routine about men and women being different or complaining about airline food. It’s just as lazy to give Jack-Jack pretty much every power in the book not already covered by the rest of the family. Where Mr. Incredible has super-strength, Elastigirl can stretch and contort her body, Dash has super-speed, and Violet can project force fields and become invisible, Jack-Jack can do everything. He can multiply himself, increase his size, light himself on fire, project lasers from his eyes, disappear in another dimension, walk through walls, and turn into a demonic version of himself. I feel like I’m forgetting at least one of his powers as well. He’s a little deus ex machina, and that’s just bad writing. Incredibles 2 does get a great deal right, though. I like that it makes the kids, especially Violet, much bigger players in what happens. She in particular is a more central character here, and of all of the characters (aside from Jack-Jack), is the one who has the most interesting changes in how her powers get used. And yet even this is a bit of a problem for me. Since this movie takes place days or weeks after the first and not months or years, there isn’t really any justification of how Violet learned to, for instance, use her force fields as an offensive weapon. This is especially the case when, because of what happens with her intended boyfriend Tony, she renounces superheroes in general, including using her powers. Ultimately, I did like Incredibles 2. It’s a good continuation of the original story, and the addition of a new collection of supers through the film is something that expands the universe in a good way. While I don’t like this nearly as much as I don the original film, this is not so much a step backwards as it is a step sideways. It moves the world where it needs to go, and certainly opens up some possibility for future movies. But, and there’s no way around this, it doesn’t have that pure joy and excitement of the first one. I mean, there’s no way it could have, but it would have been nice. Why to watch Incredibles 2: If you need someone to give you a reason, you’re beyond hope. Why not to watch: It’s lazy in places, and that’s a little sad. My main problem with the movie is that the villain's motivations are very similar to Syndrome's in the first movie, that is, a longstanding grudge against superheroes. It has a certain sameness. Although I love the visuals of the Screenslaver, which I think are really cool. Your point about the laziness of Mr. Incredible's story is well-taken, although it's a part of completely stripping him of his powers. It's also consistent with his not-paying attention, I missed my greatest adventure, persona from the first movie. He wasn't a great Dad there either. What works for me is the increased focus on Elastigirl and the excitement and joy she (surprisingly) finds in using her powers out in the open once again. I love that angle of the film. I also enjoy the hint that they may actually be living in a house formerly owned by Syndrome. Glad you finally saw it. They'd need a great deal of training for Violet for her to be able to use her forcefields that well. That said, the battle between her force fields and Voyd's portal power was pretty great. I'm not sure I agree with you on Mr. Incredible here. If we take that three month gap as accounting for Violet's training, then certainly we can give that same three months to him becoming much more involved in his kids' lives. If Vi got offensive training, he's the most likely teacher. Also, Jack-Jack manifested powers in the first movie. Yes, Syndrome (and Kari) were the only witnesses to them, but he didn't manifest them at all in those three months? They're a shock to everyone despite Kari telling them that he had powers? That's just sloppy. Like I said, it's lazy. Another week in script could have handled these problems without a lot of fuss. I completely agree that he should have shown the powers during the three month interval. My biggest surprise was the outcome of the Underminder battle. Not only is it not how anyone imagined it would go at the end of the first movie, but Mr. Incredible and the Underminer had tangled before. And then you never see the Underminer again. Oy. That it still turned out to be a good movie demonstrates the strength of the original material and characters.